Cheetah is considered to be the fastest animal on planet Earth and this fact is easy to notify when you compare to other animal's speed. The cheetah can reach 110km/h in only 5 seconds with short bursts lasting till 450 meters. Much of the cheetah's boost in speed comes from its flexible spine. At top speed, he can cover 20 feet (6 meters) in a single stride, even though its body is only about 4 feet (1,12m-1,35m). 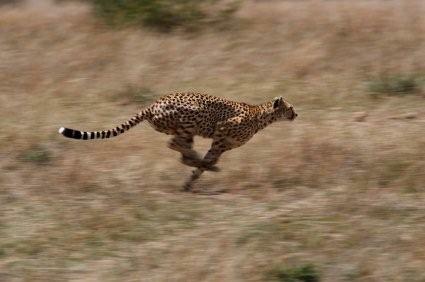 Cheetahs are nimble at high speed. They can make sudden turns in pursuit of prey and have an amazing capacity to sprint when the moment is right which helps them catch 50% of their preys. How come do they go that quick? Well they have the perfect body for speed with narrow waist, long legs, a deep chest, large nostrils, a enlarged heart and lung, special pads on their feet for traction and a long tail for balance.